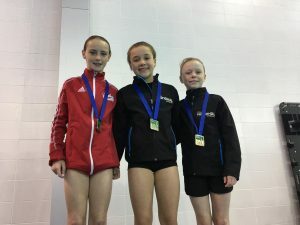 Another stellar weekend for the Ottawa National Diving Club. and finished with some amazing results. We will begin with our two youngest athletes in the Girls D category. Catherine Boyer had arguably the best weekend in her diving career to date. ONE BRONZE MEDAL on 1m. She earned all her national scores but the coolest result for her weekend is that she is the NEW 3m PROVINCIAL RECORD HOLDER!!!!!!!! She shattered a 6 year old record in Girls D 3m and now has the new record of 298.00. Huge congrats Catherine on a great weekend. That score is going to be a tough one to beat! of Ontario and is showing great improvement as the year goes on. She earned two more national scores this weekend and is now FULLY QUALIFIED on 1m and 3m. She finished off her weekend with a BRONZE MEDAL on 3m, 4th place on tower and 5th place on 1m. Great job this weekend Audree!